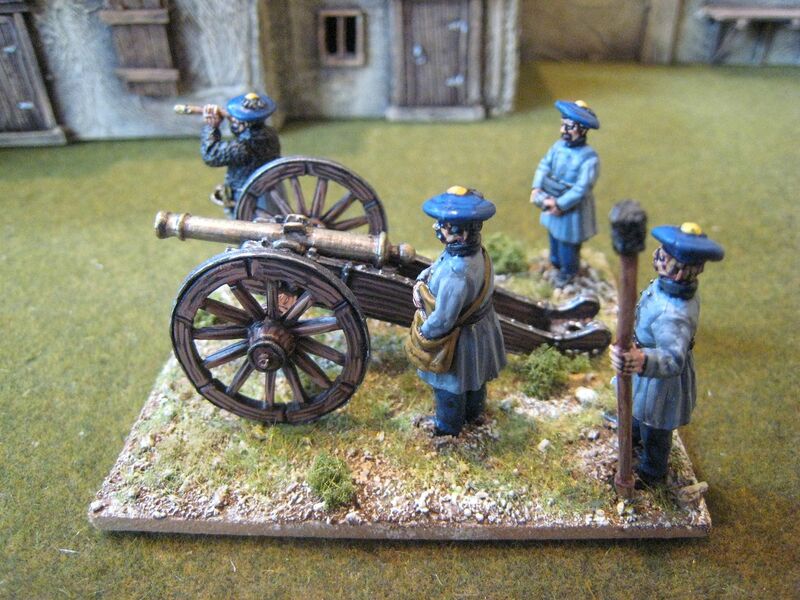 Here's another Carlist artillery piece I painted earlier in the year and completely forgot about. 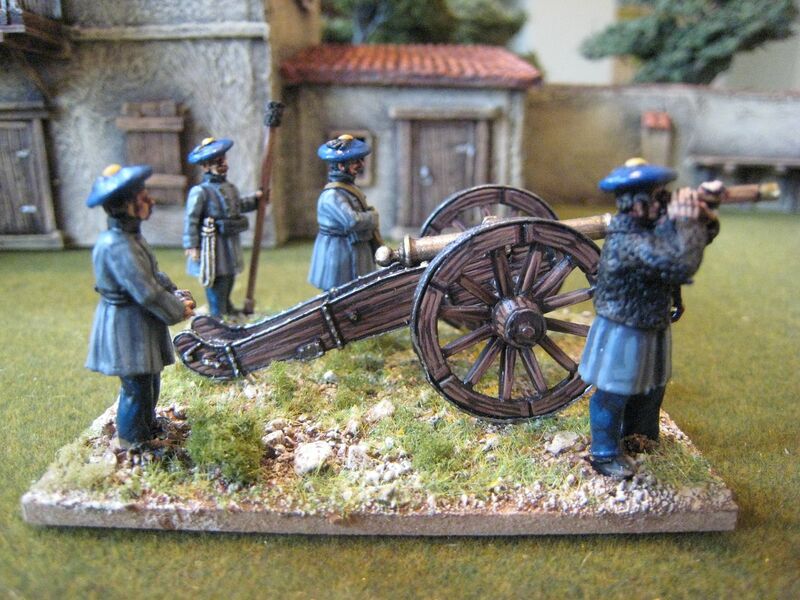 This is a French-made 6-pounder, with crew painted in the "regulation" Carlist artillery uniform of grey frock-coats with black collars, turqui trousers and turqui beret with yellow roundel and black tassel. Some sources indicate that this uniform was adopted later in the war, from 1837 onwards. 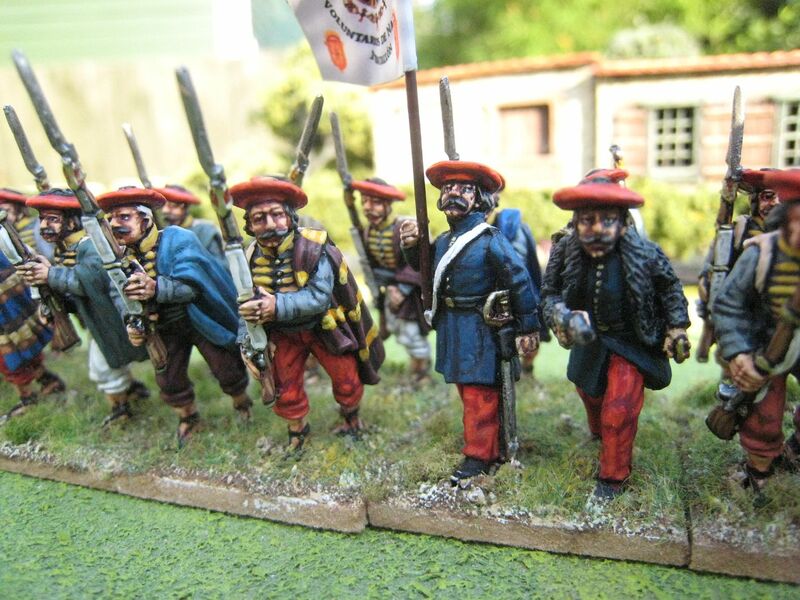 I'm not too fussed, really - you don't need much artillery for the Carlists so I'm happy to mix and match different uniforms. The gun was painted in my standard woodwork combo of Foundry's "Spearshaft 13" palette. For turqui, a blue that was used extensively by both sides, I use Foundry's "Deep Blue 20". A quick word on what I'm currently doing. "American Civil War week" is awaiting completion of the final couple of vignettes, principally a Stonewall Jackson command stand. 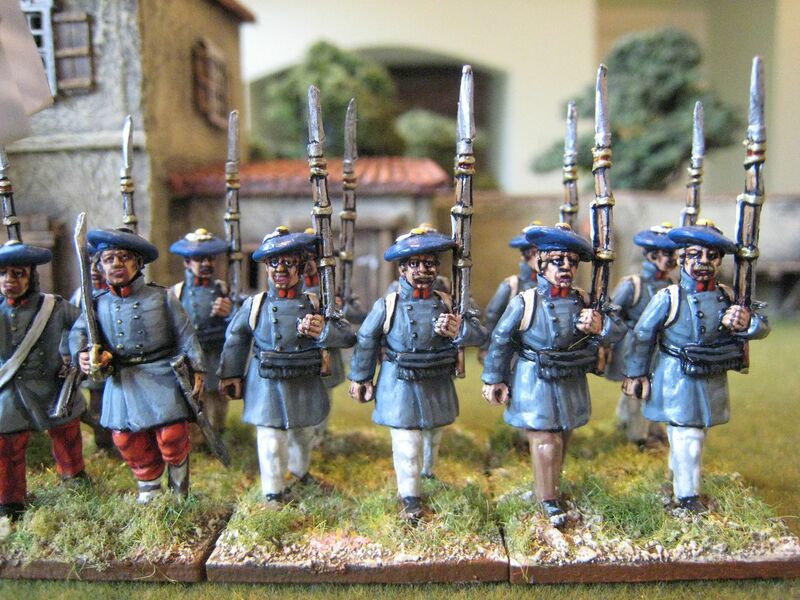 I've finished a couple of units of cavalry for the First Carlist War and some 1815 brigade command stands, all of which are currently being based. 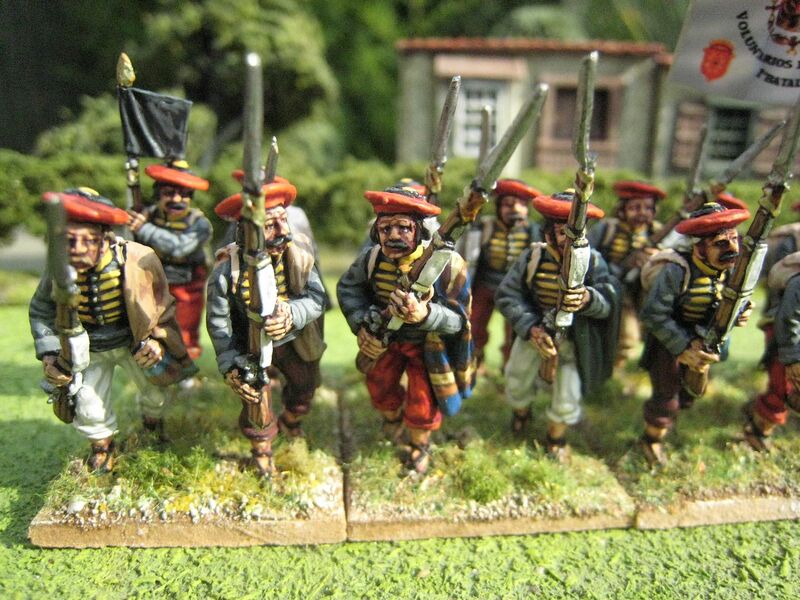 I'm currently painting the last few figures for a unit of 1815 French legere skirmishers and some AWI cavalry. In fact, I'm going through a cavalry phase at the moment - 33 horses and riders painted over the past couple of months - and I'm happy to keep that going. This means that I'm going to be spending the next few weeks on more AWI. 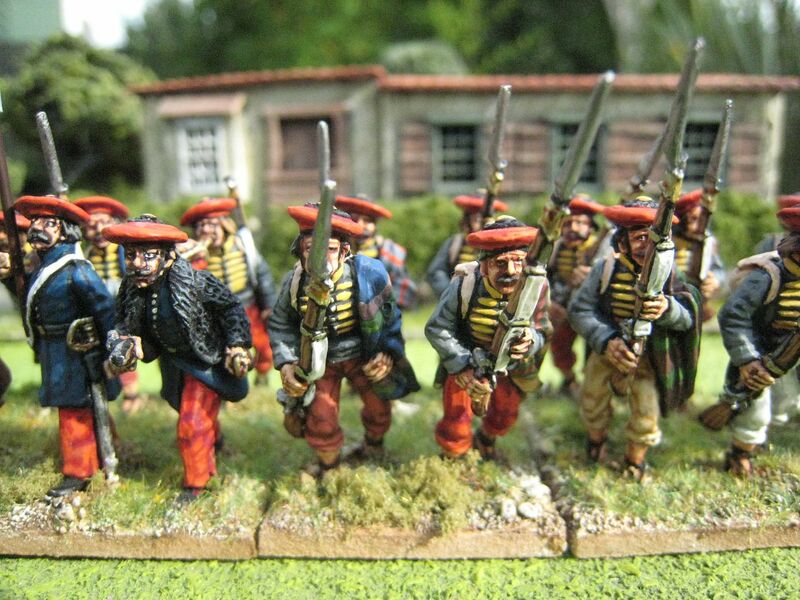 Given that the Perries have just released lots more photos of their forthcoming plastic AWI British infantry, I'm hopeful that these will be released early next year and I want to clear the AWI decks a bit prior to their arrival. Those decks include: several American cavalry units; some more British line infantry; Brunswickers; French. In the short term, however, I'm going to concentrate on the variouos Eureka Miniatures packs I bought at Salute: cavalry and French camp vignettes. In terms of posts, I have some French Foreign Legion and a full Isabelino "parade" to come before the cavalry make an appearance. Four figures. Painted February 2012. Buildings in the background by Touching History/Paul Darnell. 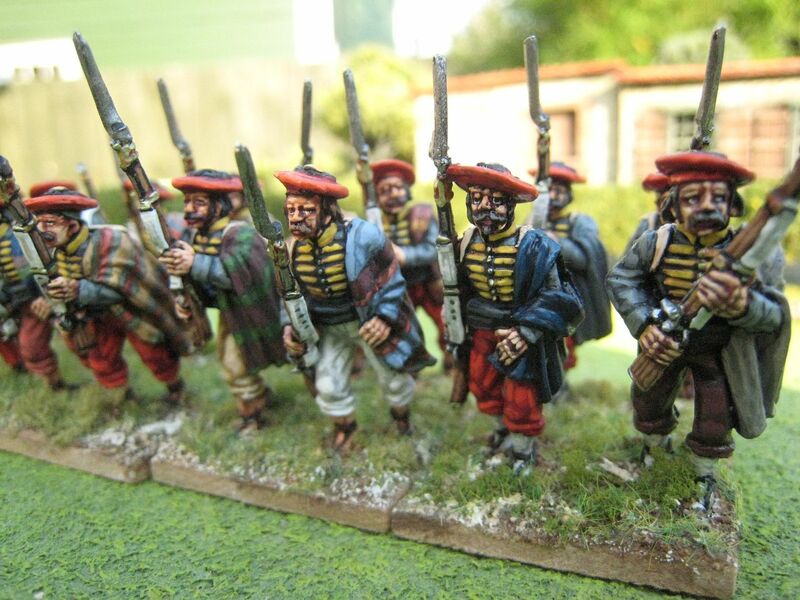 This is my third full battalion of Carlist troops, the second from the Basque province of Guipuzcoa. 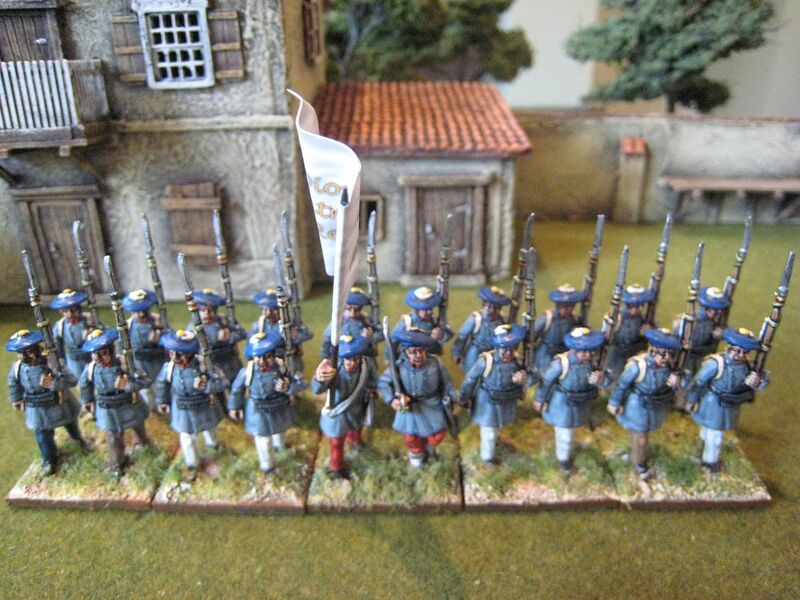 The background to these troops is explained in my post on the first battalion, here. 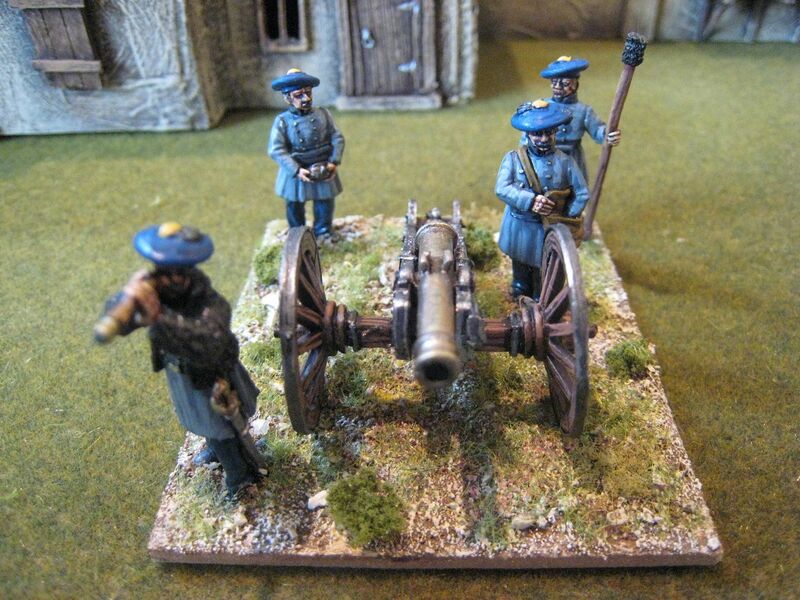 Carlists in frock coats gives you various options, from the dark blue of the Tortosa province battalions to the standard grey of Carlist armies. 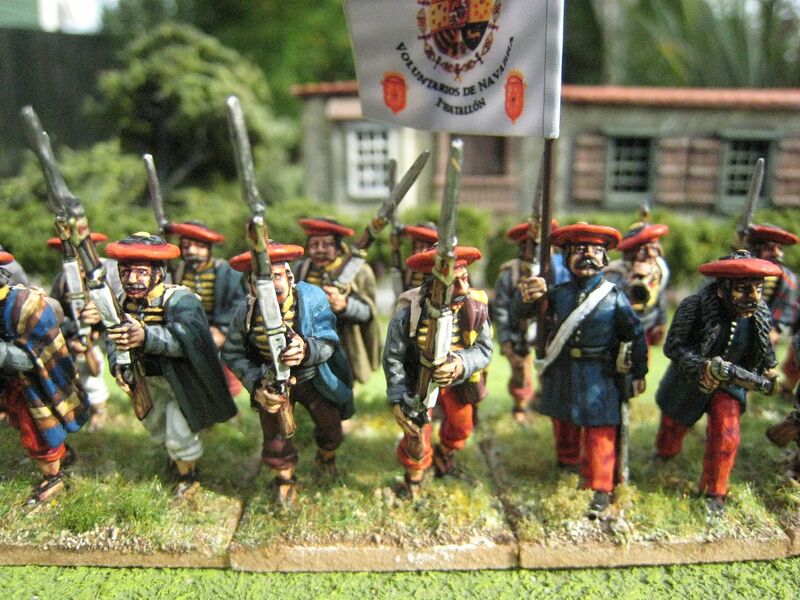 I wanted to add to my Guipuzcoa force as the orbats I've been looking at for the northern campaigns require 4-5 battalions of such troops. Frock coats worn by these units seems to have been pretty much the same colours as the greatcoats - so that's what I did here. It's acurate, but not particularly colourful. 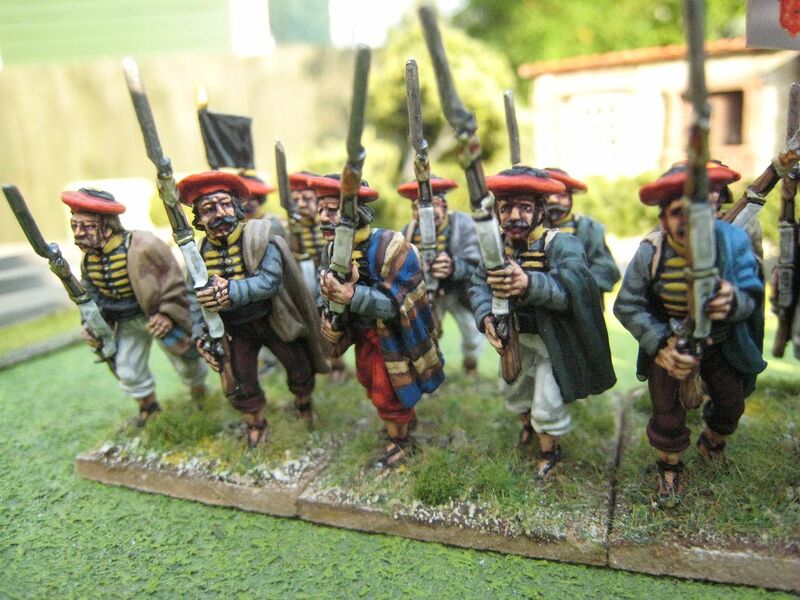 The "colour" in the Carlist armies comes from irregular and newly raised troops in civilian clothes and cavalry; some of the latter will appear here soon. 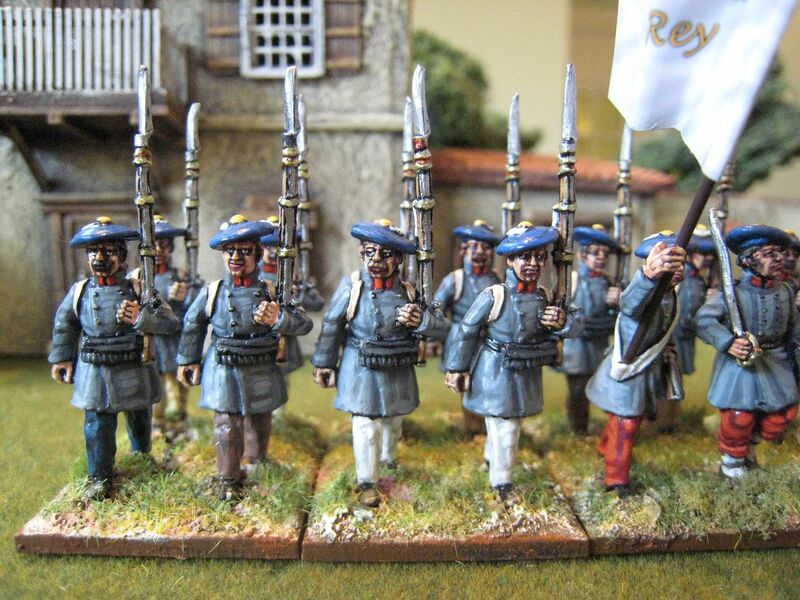 I painted these in much the same way as the first battalion. The trousers wuld have been white in the summer and red in the winter, but I wanted to mix things up to indicate troops with a variety of clothing ans some civilian brown trousers too. Nicely sculpted figures; very quick and easy to paint. The buildings in the background are by Paul Darnell/Touching History. Next up - the French Foreign Legion! 20 figures. Painted February/March 2012. Flag by Adolfo Ramos. The Basque country of north eastern Spain was a fertile recruiting ground for the Carlist cause. The area enjoyed the autonomy of remoteness and was traditional in outlook - its inhabitants were conservatives and natural Carlist supporters. The province of Navarre provided a dozen battalions to the Carlist northern army and a battalion of "Guides". 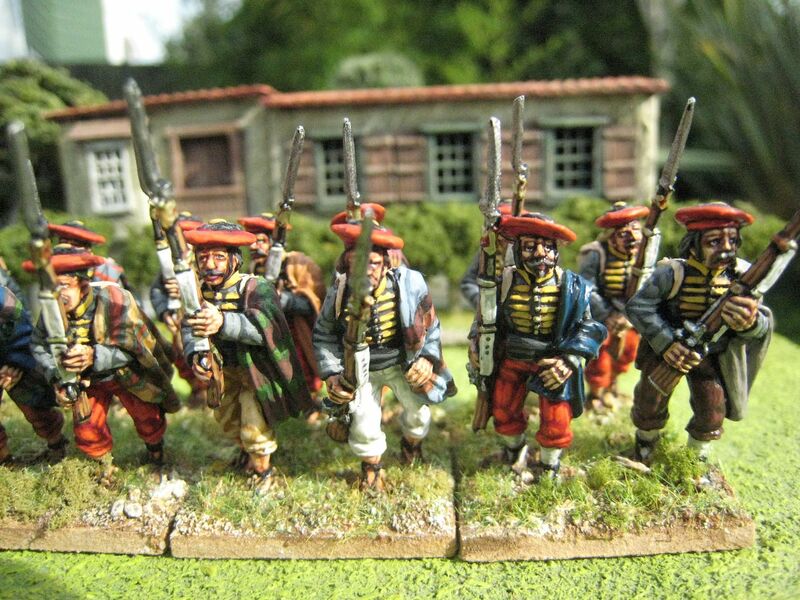 The Guides of Navarre appear to have been essentially elite light infantry. They took part in the battle of Oriamendi in March 1837 and then the Royal Expedition into central Spain in May. 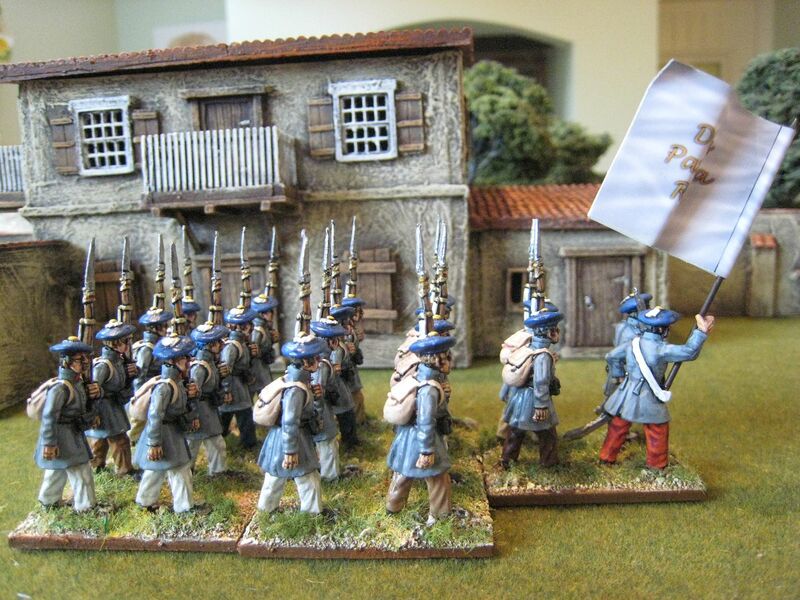 Perry Miniatures make specific figures for the Navarre Guides, as their uniform was quite distinctive. The command pack gives you 4 command figures and 2 casualties, so if you base your figures in fours you end up with a unit of 16 or 28 figures. That's not really a problem as the unit was lage anyway - some 1,000 men apparently. 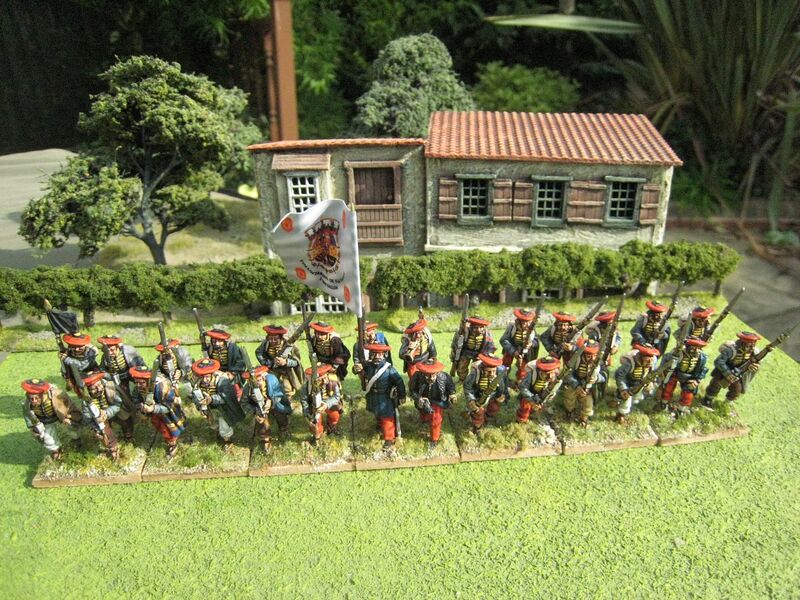 So this unit on my 1:30 ratio is almost there - and to date, my largest unit of the First Carlist War. These figures are pretty nifty and the uniforms are quite smart. Michael Perry makes very good command figures, and I particularly like the officer with the drawn pistol - he looks like he means business. I painted the coats with the Foundry "Slate Grey" palette and then used all kinds of things for the blankets. Some patterns worked ok, others didn't. I couldn't really think of patterns that didn't feature horizontal stripes of varying thickness and colours. But the overall look is ok, I think. It's a sign of how behind I am with posting that I started painting this unit in January. As it is relatively large, it took a while to finish, as I worked on other things in the meantime. I then had to order the flag from Adolfo Ramos direct in Spain (which was very easy to do, as it happened). 28 figures. Painted January to March 2012. Flag from Adolfo Ramos.